This style of preparing potatoes is popular for good reason: Not only are they visually striking, you also get some of the benefits of a gratin—thin, tender slices and deliciously crusty edges—without the heavy sauce. I especially like this technique for sweet potatoes, which are grown in Texas much of the year. Reprinted with permission from Meatless in Cowtown: A Vegetarian Guide to Food and Wine, Texas Style © 2015 by Laura Samuel Meyn and Anthony Head, Running Press, a member of the Perseus Books Group. Photos by Jason Varney. This style of preparing sweet potatoes is popular for good reason: Not only are they visually striking, you also get some of the benefits of a gratin, without the heavy sauce. Preheat the oven to 425° F. Line a large baking dish with parchment paper. Place the peeled sweet potatoes on a work surface. Using two wooden spoon handles as a guide along both long sides of one potato (to prevent the knife from slicing all the way through the potato), slice the potato crosswise into very thin slices that go at least three quarters of the way through. Gently slide one very thin garlic slice between every other slice in the sweet potato (the garlic slices will help to hold the sweet potato slices slightly apart). Repeat with the remaining potatoes and garlic slices. In a small bowl, whisk the oil, chili powder, and salt to blend. Using a pastry brush, generously brush the mixture all over the potatoes. Place the potatoes in the prepared dish. Brush the mixture again over the tops of the potatoes a couple of times, allowing the oil to drip between the slices (some of the oil mixture might be left over). Bake until the sweet potatoes are tender all the way through and the tops of the slices are beginning to get crusty and golden brown, 1 hour 10 minutes to 1 hour 15 minutes. Serve warm or at room temperature. 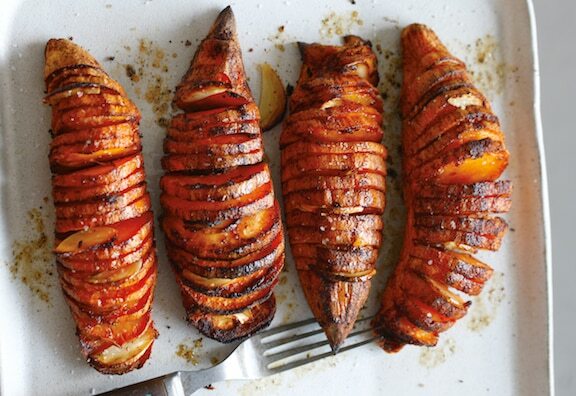 Here are more recipes for making the most of Sweet Potatoes.